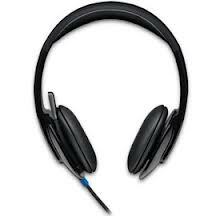 A high-quality, high-performance headset that brings your PC calls and music to life.As simple as plug-and-playWith the plug-and-play USB connection, you’ll experience crisp, digital stereo and more true-to-life calls almost instantaneously.Listen to the detailsLaser-tuned drivers and a built-in equalizer minimize distortion, so you can get to the heart of all your music, movies and calling. It’s the kind of precision audio that exemplifies the difference between merely hearing and truly wanting to listen.Experience crystal-clear chattingBreathe new life into your chatting. The adjustable microphone reduces background noises, so your friends, family and business associates can hear more of what they want—your crystal clear voice.Take control of the soundUse the on-ear controls for simple volume adjusting and instant mic muting. Plus, you’ll never talk with the mute on again, thanks to the easy-to-see mute indicator light.It’s all about comfortSoft leatherette padding is easy on your ears—especially when you’re listening to music or chatting for hours. Worried about the fit? Don’t be. The padding on the headband ensures a fit that molds comfortably to the contours of your head.